Being the fourth-largest economy in the world in purchasing power parity (PPP) terms, India is a preferred destination for FDI, but the country’s foreign direct investment (FDI) is headed for the first drop since the year ending March 2003, hindering a bid to match China’s surging economy, even as overseas money poured into Indian stock and bonds at a record pace. Data released by the department of industrial policy and promotion (DIPP) shows that total direct investment fell 24% to $19 billion between April and November compared with the same period a year earlier. However the country has attracted a lot of money into equities and bonds. According to the latest data from the Reserve Bank of India (RBI), inflows into equities and bonds jumped 48% to $32.8 billion during the same period. 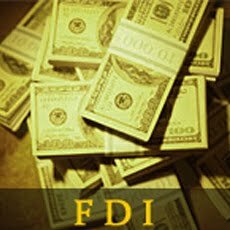 However, the FDI trend in India is in contrast to most other emerging countries. According to estimates given by the United Nations, most Asian nations reported a rise in FDI in calendar year 2010. Investment surged 163% in Indonesia, 123% in Singapore, 29% in Hong Kong and 6% in China. Part of this has to do with the communist country attracting much greater FDI than India.